HomeRubber Bracelet Wristbands"Hope Courage Faith" Orange Rubber Bracelet Wristband - Adult 8"
Buy our "Hope Courage Faith" Orange Rubber Bracelet Wristband and show you care about causes represented by the color orange. 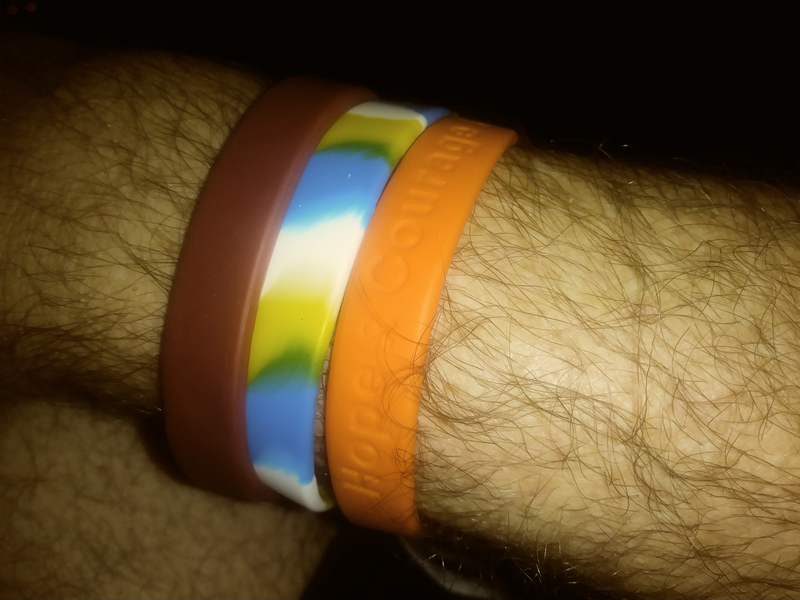 Our adult-sized "Hope Courage Faith" wristband is made from 100% seamless silicone rubber. Comes packaged in an individual polybag. We also carry "Orange Ribbon Magnets." Allow us to create custom "Hope Courage Faith " Rubber Bracelets and Ribbon Magnets for your organization or next event. I ordered 50 of these in support of a friend who was recently diagnosed with leukemia (APL). She was thrilled and we love wearing them in support for her!! Her first bone marrow biopsy showed she is in remission after 39 days of her diagnosis. Great Wristbands and Great Service! I was very pleased with the Orange Rubber Bracelet Wristbands that we can wear to uplift our niece and nephew in their battles of Cancer. The service I received from the Support Store was excellent! I highly recommend them to all I know. Thanks so much! My favorite color, the bracelet fits me great and looks good on my wrist and what a great message!! I have been looking for a place to purchase these wristbands for a long time! I finally found the Support Store where I can get as many wristbands as I want with many cause choices to choose from. So glad I found them! My family are all wearing this to support MS...Thank you for offering this for such an AMAZING price! I sent this gift to a friend to support me in my kidney cancer battle. Arrived perfectly packaged, ahead of time, and ready to use for our men's gathering. Fits well. Wish the words were a different color thanthe bracelet so it would stand out more. The bracelet wristband is made of good quality. The shipping was very fast and accurate. The Support Store support various foundations when you purchase from them. Excellent experience ordering from this company. Best UsesThe leukemia bracelet wristbands were bought to support my nephew who has leukemia and is undergoing treatments. By purchasing the wristbands I was also supporting the leukemia foundation because the Support Store gives generous donations to various foundations and leukemia is one of them.